Whether you�re actually on honeymoon, or just looking for a splash of romance in your life, Bali Pavilions is the perfect place to indulge in a large dose of romantic luxury. Bridget McNulty fell in love. It�s impossible not to fall in love with Bali Pavilions... It�s the kind of place you�ll visit for a few days, and then talk about for years afterwards. Whether it�s for a honeymoon, an anniversary, or just a very special holiday, this is one stop on your itinerary to look forward to, guaranteed. 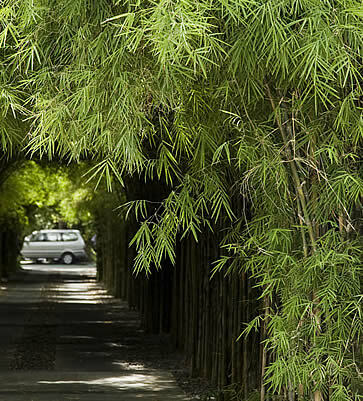 You�ll feel the difference as soon as you step into the bamboo-shaded walkway leading to the hotel. All of a sudden, the noise from the busy street outside dissipates, and you can hear the birds, and the relaxing murmur of waterfalls in the distance. 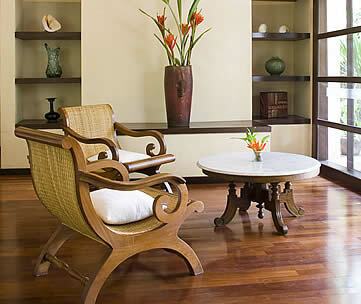 A sense of peace descends as you step into the cool reception area and sip on a deliciously minty welcoming drink. You can relax, now. You�re on holiday. This sense of relaxation only increases when you step into your villa � an entirely private space set back from the pathways and invisible to all your neighbours. Outside, there�s a large wooden sundeck with umbrella and loungers, and a private pool to cool down in the hot Bali afternoons. A walled tropical garden shows off sprays of bougainvillea or branches of fresh mangoes, and a fountain running into the pool ensures that nothing will disturb the peace and tranquillity of this space. Inside, it�s even more tranquil � the large sitting room area is flanked by windows on all sides, to let in the view and the sunlight, and a small kitchenette ensures you can help yourself to tea or coffee or a snack any time of the day or night. The bathroom is massive and luxurious, a sunken bath (filled with flowers on our arrival) and large shower taking pride of place indoors, while an outdoor option offers a refreshing alternative if you prefer a dose of fresh air with your shower. Upstairs, a decadent four-poster king size bed welcomes you to sleep in� You are on holiday, after all. Of course, this was just our villa, a beautiful honeymoon villa (that I�d highly recommend � number 20). Each villa is entirely unique, though, and I have a feeling you�d fall in love with whichever one you were lucky enough to stay in. There are common traits throughout � a sophisticated sense of design ensures that each piece of Balinese art, each lamp and carefully lit-up vase of tropical flowers feels hand-chosen, rather than hotel-chosen, which is probably because that is the case. Ilsoon Kang, the manager, is constantly renovating each villa, so that there�s always something new and improved, always something changing. This hands-on management gives the whole resort a looked-after feeling, you can sense that you�re in good hands. The many returning visitors often choose to stay only in �their� villa. You�ll soon see why people feel so possessive: it really feels as if you�ve come home the moment you step inside � there�s ample space to unpack in the large cupboards, enough room indoors and out to unwind, and nobody to interrupt your privacy. Nobody, that is, except for the ladies from the spa offering you a complimentary welcoming foot massage (simply heavenly!) and your butler, constantly on call. But mainly you�ll fall in love with the sense of romance and relaxation that pervades every corner of the resort, and simply forces you to unwind. The picture of Bali that so many people have in their head � sun, sea, lying by the pool reading � comes to life at Bali Pavilions, in the most delicious way. Yes, the sea is an eight-minute walk away, but who needs it when you have your own private pool? 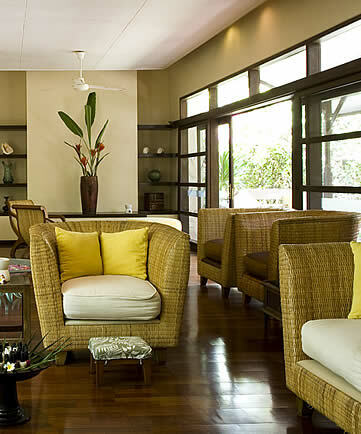 And if you�re worried about not having brought enough reading material, never fear � the resort has a fantastically stocked library and DVD collection. To end this day of relaxation and pampering, we headed to the Jahe Restaurant for dinner in a private candle-lit pagoda, although we could also have chosen to eat in our villa. Still, to sit in an individual pagoda, hung with sheer white curtains and secluded in the middle of a candlelit garden scented with jasmine, is a pretty unbeatable way to end a day. 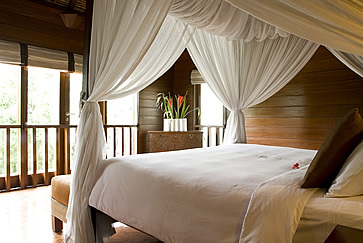 In fact, Bali Pavilions provides a pretty unbeatable way to start and end every day. Breakfast is served in your villa, by your butler, and if there�s anything you need during the day, he�s on call. The reception staff is ever-friendly and ready to help with anything you need, so there�s really no need to do anything but succumb to the lure of relaxation. And that�s what we did. For a beautifully blissed-out two days we luxuriated in the Bali dream: lying by the pool, in the sun, wrapped up in romance. Some might call it the perfect holiday. Style Exotic luxury. Each villa is completely different, but all have the same key elements: extremely comfortable and spacious, windows on all sides to let in the tropical garden and the breeze, and serenely secluded. Setting Bali Pavilions sits on a hectare of land, filled with large trees, indigenous plants and bamboo-shaded walkways. It is set back from the main road in Sanur, a small, laidback town filled with restaurants and shops. Why you'll love it It�s instantly relaxing. You�ll feel right at home, if your home is large, luxurious, and beautifully decorated. Each villa is a world unto its own, so you can really unwind, without fear of interruption. Good to know There�s a shuttle to the beach every two hours � at 10am, 12pm, 2pm and 4pm, although it�s only an 8 minute walk so you can take a stroll there any time you wish. There�s a limitless supply of mineral water in the villa, and each villa is equipped with a small kitchenette where you can make simple lunches or a pot of coffee or tea. Internet is freely available in the lobby. Wow factor The extraordinary privacy and sense of space. It doesn�t feel like a hotel at all, more like a holiday home. Best rooms or suites to book There are 25 villas, four of them two-bedroom (two with two doubles and two with one double, two singles). Other than that, each villa is roughly the same size and has the same amenities (except for the Garden Villas, which don�t have private pools, but are right next to the main pool). Each villa has its own special character, so unless you have a special request (outdoor bath, outdoor shower), you�ll probably fall in love with whichever room you are given. Room for improvement If anything, the service is a little too ever-present. The turn-down service came before dinner, and was very thorough (cleaning the kitchen and bathroom as well as turning down the bedroom), which was a little disruptive. Other than that, no complaints at all. The management asks each guest for suggestions as they leave, and it�s obvious all this constructive criticism has been taken into account. Address Jl. Danau Tamblingan 76, Sanur, Bali, 80228 Indonesia. Two Bedroom Pool Villa US$450. All rates subject to 21% local taxes and service charges, all include breakfast. US$40 surcharge on each villa from 1 July to 30 September and 23 December to 6 January. 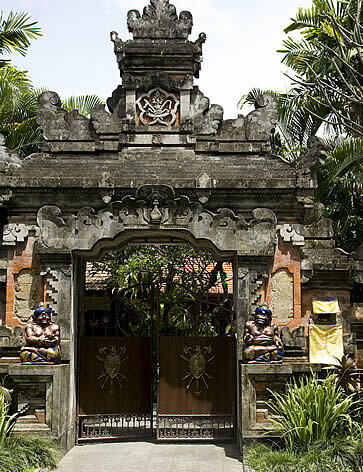 How to get there Bali Pavilions is 30 minutes or 18km from Bali�s Ngurah Rai International Airport. Travel Services The concierge service at reception can arrange all kinds of tours and adventures, from golf to surfing, sunset cruises, bungee jumping and cultural tours.